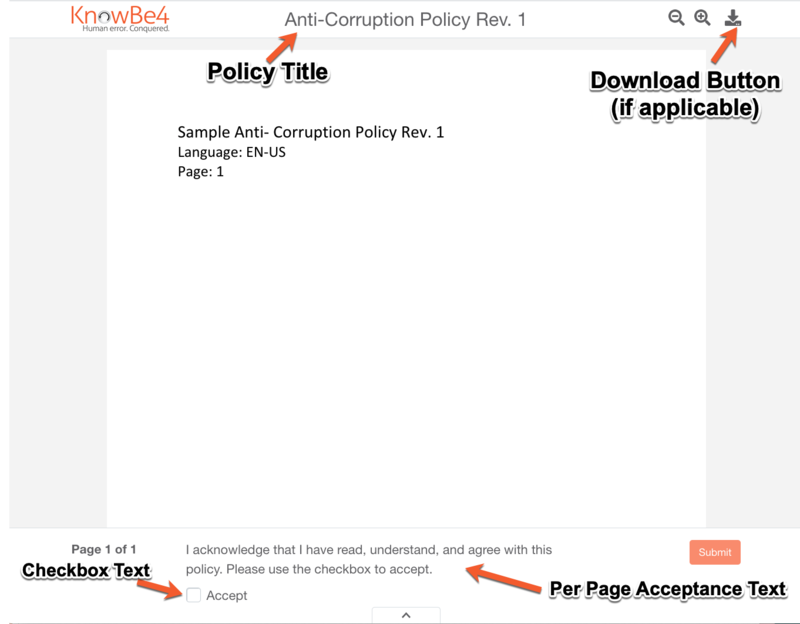 How Do I Add and Manage my Organization's Policies in my KnowBe4 Console? The Policy Management feature in your Security Awareness Training platform is a tool you can use to store, distribute, and track the various acknowledgments and agreements required of the employees in your organization. You can use training campaigns in your KnowBe4 console to assign and distribute your organization's policies. This gives you the ability to track which users have acknowledged the policies and how much time they spent reviewing the policies. 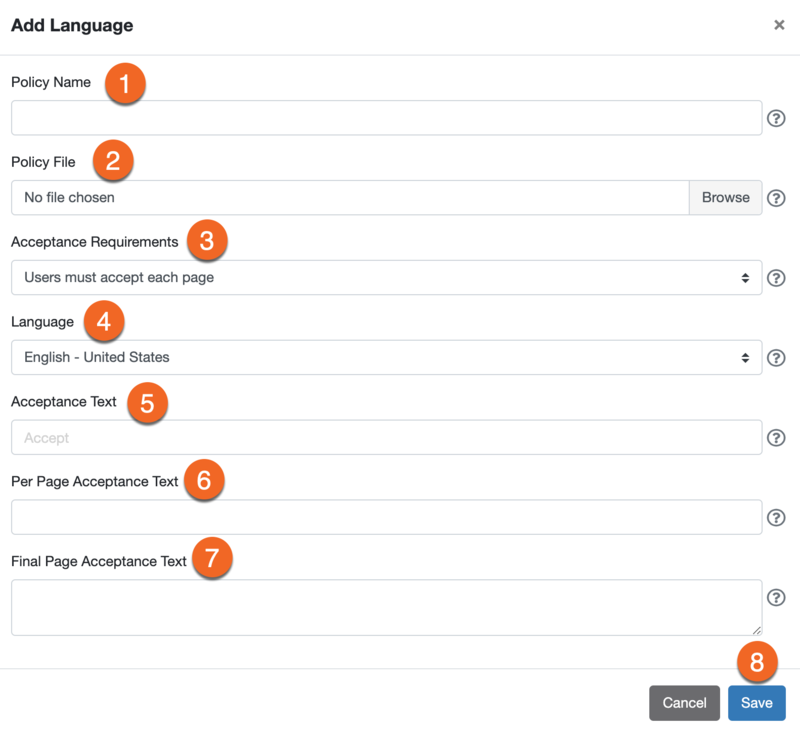 You can even set an optional minimum review time for users to spend reading policies. You can upload your organization's policies in a PDF format. To create a new policy, log in to your console, navigate to the Training section, and click on the Policies tab. From there, click the + Create Policy button to add your policy. Title: Add the title of your policy or agreement. As a best practice, we recommend adding the policy version and/or creation date to the title. This title will display on the interface your users will see when reading the policy. Published: Enabling the Published toggle button will allow you to assign the policy to users through a campaign. You can leave the policy unpublished if you need to edit it or add additional language versions before distributing it to your employees. Required Review Minutes: (optional) You can specify a minimum number of minutes that users are required to spend reviewing the policy before having the ability to acknowledge it. Allow Download: (optional) If you enable this checkbox your users will have the option to download the policy from the Policy Viewer interface. Description: Here you can provide your users with details about the policy and the acknowledgment process. When your users log in to the console to acknowledge the policies you've assigned, they'll see this description underneath the policy title. If you choose to use the "Required Review Minutes" option, include this required time in the description so your users know how much time they must spend reading the policy before they're able to acknowledge. Upload: Use the Choose File button to upload a PDF file. Select Policy Language: Choose the language of the uploaded policy file from this drop-down menu. If you upload multiple versions of the policy PDF, your users will be able to pick which language they want to read the policy in. Policy Acceptance Requirements: Choose what type of acknowledgment you want to require of your users. You can require that they acknowledge each page of your policy or only the final page. Checkbox text: This is the text shown in the Policy Viewer interface, next to the checkbox that serves as the acknowledgment submission. It can say something simple, such as "Accept" or "I Agree". The ability to specify this text is helpful for policies with various language versions. Per Page Acceptance Text: (optional) This text is displayed at the bottom of the Policy Viewer interface, for each page of the policy, aside from the final page. If you require users to accept each page, this text will accompany the checkbox your users click before proceeding to the next page of the policy. Final Page Acceptance Text: (optional) This text is displayed at the bottom of the Policy Viewer interface, on the final page of the policy. This text will accompany the acknowledgment checkbox users are required to check. Save File: Click this button to save this language version of the policy. + Add Language: Use this button to upload the policy in an additional language. Ideally, you'll also add the acceptance text details in the appropriate language for the policy. Save Policy: Once you've added all necessary language versions, click this button to save the policy. Policies can be edited to add additional versions. Although, once a policy is in a campaign, original policy files should not be changed to a revised version. See the next section for more information. 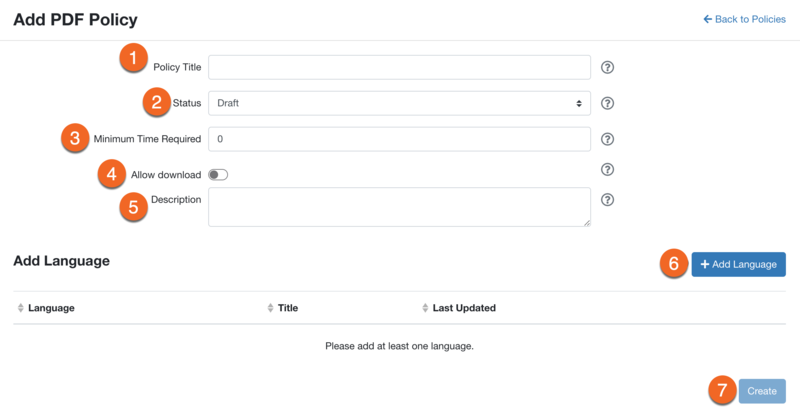 After a policy has been created, you can edit the policy or add additional language versions as needed. If a policy has already been distributed through a campaign: As a best practice, if you need to update a policy to a newer version, we strongly recommend creating a new policy and a new campaign rather than editing the existing policy. You can edit a policy by clicking the drop-down arrow to the far right of the policy title, as shown below. From the policy editing page, you can edit the general policy details, add additional language versions, edit existing language versions, and change the default policy language option. The default language is the first shown in the drop-down menu that users see before opening the policy. See an example of the drop-down menu here. Once you've added one or more policies to your account, you will assign and distribute the policy to your users by creating a training campaign. To create a training campaign for your policy, navigate to the Training section of your console, and click on the Campaigns tab. Then, click the + Create Campaign button. You can set up the training campaign as you normally would. See our Training Campaigns article for details. You have the ability to assign both policies and training content in the same campaign. The "Content" drop-down menu will contain two sections: Courses and Policies. Choose any combination of content to include in your campaign. See our FAQ: Can I arrange the order of the content I assign through training campaigns? Once a campaign has started, you can monitor the status of all user acknowledgments as well as any training courses you may have included in your campaign. Click on the campaign name under the Campaigns tab to view the details of that campaign. For more information see the Monitoring Campaigns section of our Training Campaigns and Course Management article. The Users tab (shown below) will provide detailed information on each user's status in the campaign. Here you can see when users were enrolled in the campaign, their current status in the policy acknowledgment (or course completion), the time they've spent reviewing the policy (or in a course), and the amount of time they have left before the content is due. From this page, you can also send manual reminder notifications, pass users, reset users' progress on a course or policy, and download a CSV file containing details about the completion status of all enrolled users. If you've set up campaign notifications to send to your end users (for example, reminding them to acknowledge your organization's policies) they'll use the link in the notification email to access the console. As an account administrator, you have the ability to customize the notifications that you can automate when setting up a campaign. These notifications can be sent to users, users' managers, and account administrators at a frequency that you choose. See here for more general information on campaign notifications, and see here for more information on customizing training notifications. Once users have logged into their account, they'll see the active campaigns they're enrolled in and can click Start to open and view their policy assignment. The policy will open in a new window, so users must have their pop-up blocker turned off, or allow the window to open when prompted. 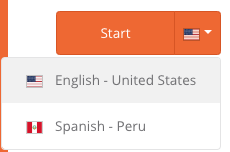 If you've added multiple language versions of the policy, users can click the Flag drop-down button to choose their native language, before clicking Start Policy (see below). Users will review the policy in the Policy Viewer, shown below. Users will navigate through the policy by clicking the forward navigation arrow. If you've required users to agree to each page of the policy, they'll have to click the acceptance checkbox before proceeding to the next page. Otherwise, users will navigate through the entire policy, then click the acceptance checkbox once they've read the final page of the policy. After clicking the acceptance checkbox, users must close the Policy Viewer window in order to receive a Completed status for their policy acknowledgment. If you've enabled the policy Allow Download feature, users can click the Download button at the top of the page to save a copy of the PDF file. If you've assigned Required Review Minutes to a policy, users must spend this amount of time reading the policy before they will be able to accept it. If users attempt to click the final acknowledgment checkbox prior to the time requirement, they will be prompted with a warning message, shown below. Question: After assigning a policy through a campaign, I added an additional language version to the policy. Will users in the campaign be able to view the policy in the additional language? Answer: Yes. Any edits made to the policy will be automatically reflected in the policy campaign. Question: Can you preview all language versions of the policy? Answer: Only the default version of the policy will be available for preview in the console. If you'd like to preview the remaining versions, temporarily change the default version of the policy. See the Editing Policies section of this article for more info. Question: Can I arrange the order of the content I assign through training campaigns? Answer: Yes. From the Create New Training Campaign page, drag and drop the content to the desired order, as shown below. When the users log in to complete their training and/or policies, they'll see the content in this order. 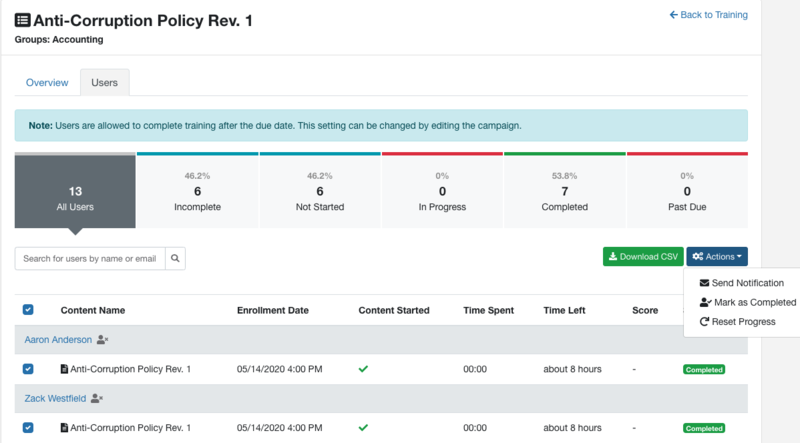 Question: Why can't I see/select my policy when creating a training campaign? Answer: Ensure you've published the policy under the Training > Policies tab before creating a new campaign. To do so, click on the drop-down arrow to the far right of the policy name, then click Edit. Enable the Publish toggle and save the policy. Question: Why don't the "Users who did not acknowledge their course policies" and "Users who acknowledged their course policies" reports under the Training > Reports tab include my policy campaign users? Answer: These specific reports are related to the alternative method of mandating policy acknowledgments through your console. You can find more information on this type of Policy Acknowledgement here. If you would like reports for your training campaigns that include policy PDF files, see the Monitoring Policy Acknowledgments portion of this article. Question: Can I assign Security Roles to an individual that I want to handle policy management, distribution, and acknowledgment? Answer: Yes. You can add one or more users to a group in your console for the purpose of assigning the necessary Security Roles for policy management. See our Security Roles article for more information. Question: Is there a maximum file size for policy PDFs? Answer: No. However, the system may time out if files are excessively large. If this happens, try reducing the file size and uploading again. Question: I have links in my policy and I can't click them. Why aren't the links clickable in my policy viewer? Answer: Are you using a Mac? If so, you must use PDFs that have been created in Adobe Acrobat if you want to have clickable links for your users within your policy.